The AAA flashlight design is one of the most widely used flashlights of today. Considered an “Every Day Carry” (EDC), finding the best AAA flashlight is hard to come by because there are so many choices out there. When you are searching for your AAA flashlight, keep a few things in mind. Be small enough to be carried with minimum effort and thought. Ideally, it would attach to something else you already are in the habit of carrying like your keys. That way, it’s with you during an emergency. Have sufficient runtime ( at least 1 hour) to last the length of typical emergencies with an additional amount as backup. Use a common battery that can be found throughout the world and can also be scavenged from other gear. Be durable enough that it can be depended on over a wide type of emergencies including floods, fire, earthquake, etc. It should be at least as durable as the person carrying it. The Fenix company was started in 2004 in a small country called China and has specialized in R&R, manufacturing and sales of outdoor sports lights such as flashlights, headlamps and bike lights. They launched their first flashlight in 2005 and since then continued to put out incredible works of art. Today, Fenix products have been sold all over the world and have made a name for themselves as one of the premium LED lighting brands. Recently, Fenix came out with the TK35, and the Fenix TK22 flashlights, winning the Zunlv Award in China. They are committed to innovative outdoor lights and achieving customer satisfaction. One of Fenix’s product lines is the LD series (Light Duty), One of the coolest flashlights in the lineup is the Fenix LD01 which is extremely small and not much bigger than the AAA battery it uses. 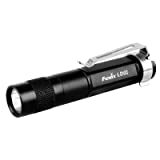 It has 3 modes and puts out over 70 lumens on the highest mode. By turning the head one way to turn on and the other way to turn off, you will see how easy it is to operate. If you want to switch between modes, just rotate the head from on/off within 2 seconds. Now I have said before that I like my Gerber because it is so light in weight and attaches to my keychain. On the other hand it is not as powerful as something the Fenix LD01, in fact it is about 1/2 the lumens as this thing. Even on the highest mode this light can stay on for about 1 1/2 hours which is more than most of the AAA flashlight manufacturers can say about theirs. Since I have purchased this flashlight, I have found myself using it way more than I thought I would. I am actually considering purchasing a second one to add on my wife’s keychain for her. It does come with a pocket clip for those that don’t want the keychain look, so either way I would consider you buying it to try out. Bottom line: I have found that this has to in the top 5 rated and considered for the rank of best AAA flashlight, because of the size, sleekness of the body, output amount and the fact it has 3 modes. The Pelican Products, Inc. was founded in 1976 by Dave Parker in a town called Torrance, California. He started the company small, right out of his garage, he started the company because he was an avid Scuba diver. Mr. Parker was looking for tough flashlights and cases that would not leak or fail. The Pelican company now has over 1,500 employees and has 22 offices worldwide. Pelican builds their products to last a lifetime. The Pelican 1910 LED is one of the companies more recent creations, it is compact aluminum and designed with style and function in mind. It uses just 1 AAA battery can puts out about 39 lumens for an hour. I have found that the beam of light is very clean and bright white with little to no voids in center ring. The company says that it has a long run time of 1 hour but I disagree. I think the 1 hours burn time on this flashlight is the middle of the road when it comes to the best AAA flashlight and how long the light should burn for. Although this is a very popular light and I really do like it, I think that the updated version will run for a little longer. One huge benefit of the Pelican 1910 LED is the tailcap forward clicky switch like some tactical flashlights, it is made of rubber and has a momentary on position and and a constant on position. It might not be a waterproof flashlight because of the tailcap switch but does have o-rings in a few different places, so I’m sure it can withstand most of the weather you will have it in. Another nice feature of this flashlight is the belt clip. The belt clip has a metal ring at the top which fits under the tailcap for a secure fit and will not rotate around the flashlight. This is the type of flashlight that has all the perfect benefits of a much larger tactical style flashlight has but just a fraction of the size and cost. This is the type of flashlight that is perfect for a technician, outdoorsman, electrician or pretty much anyone looking for a pocket flashlight. 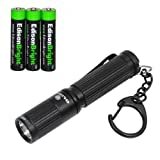 Bottom line: If you are looking for an EDC flashlight that uses only one AAA battery and want it to be super lightweight, then this is a great choice and you should consider it to be your best AAA flashlight and add to your collection. Weight without batteries 1 oz. Olight is one of the fastest growing outdoors lighting companies, started in 2006 manufacturing high end illumination tools. Originally Olight focused only on the general outdoor use and enthusiast markets, but quickly moved in the the more specialized markets. Due to so many customers requesting flashlights for military, law enforcement or other tactical purposes, Olight launched the M20 tactical flashlight. Later in 2009, Olight incorporated another excellent brand called iTP into the family. From their the Olight companies have been rapidly growing and expanding and continue to make fair priced illumination tools for people all over the world. The i Series by Olight was designed to be a powerful yet cost effective EDC type flashlight. It is made from premium type III hard- anodized aluminum with an anti abrasive finish. This is one of those flashlights that could be stowed away in so many placed and forgot about, it is only 2.75″ long and 1/2″ wide. 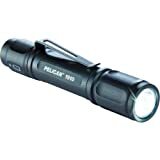 Many people that use this flashlight say they forget they are carrying it. One nice thing is that you can carry it on your keychain or remove the keychain and use the very strong belt clip. Its simple design is deceiving in the fact that it actually has a very sophisticated micro chip processor inside. By having this processor, it can put out light in 3 different modes, one of them being 70 lumens and the runtime is just over 1 hour. By twisting the head on/off quickly, you can change from low, med. high modes very easily. If you are like many people out there that likes to carry a multi-tool this is a perfect every day carry flashlight for you. The Olight I3 is small enough to fit in the Leatherman Wave holster along with the multi-tool itself, giving you less bulk on your person. Bottom line: This flashlight made the list of best AAA flashlights because of the small yet durable design, the output power of 70 lumens and the 3 modes it has. Don’t be fooled by the inexpensive price either, although the Olight company is fairly new, they are putting out good tools at great prices. Includes free high-quality and high-capacity AAA battery. Of all the great flashlight companies out there right now, the Streamlight company takes on a very unique approach to meeting customer needs. For over 40 years now, Streamlight has amazed their customers and competitors with their unique approach. Streamlight the company is not made up of just board members, VPs and employees but instead made of outdoor enthusiasts. The people of Streamlight are proud to be hunters, fishermen, and outdoor enthusiasts. They take on training courses similar to law enforcement, firefighters and ems would take as on going education. By taking this approach, Streamlight gets to know more about their customers real life situations that would require the flashlights they produce. Streamlight makes several different flashlights, the Stylus and the Microstream both use the AAA batteries. The difference is, that the Stylus uses 2 AAA batteries, where the Microstream uses only a single AAA battery. Like other Streamlight flashlights, the Microstream is made in china. It is on its second revision, with the first to have an issue with the head. People could actually remove the head and replace with a Fenix LD01 head, making it a multi mode hybrid flashlight. The new version has solved that issue and has a one piece body. The Streamlight Microstream also has a more robust tail switch, and two way belt clip. Now you can clip it to your belt and your hat. The Streamlight Microstream utilizes the forward clicky switch for “momentary on” or “tactical” situations. Although people have commented about the light switch being “stiff” and hard to turn on, I like this feature. I think it makes it more difficult for the light to accidently turn on while in your backpack or in your pocket. For a budget flashlight, this this is pretty well build, as you will see, it has a great anodized finish which gives a strong scratch resistance. Surprising the light has a smooth reflector, giving it more throw than some of the other lights in the same price range. Uses a poly lens which is still pretty good and durable. Now you can use a Li-ion battery if you would like but the manufacturer does say it can also use the standard AAA. The runtime on a Li-ion battery is almost 4 hours too. Bottom line: This Streamlight Microstream is not the most powerful AAA flashlight out there, but at 28 lumens it does have a pretty nice beam and can run with the big dogs in my opinion. I think this is a perfect light for those doing plumbing, technical jobs, computer repair and many other tasks. I consider this #4 on the best AAA flashlight list. The Thrunite Ti LED is a nice light that runs on AAA batteries. It has plenty of knurling on the hard anodized aluminum body and uses the rotating head style on/off switch. With just an 1/8 turn you can go from the low mode to high mode. It is really designed as a keychain flashlight so it does not come with a clip. The low setting of 3 lumens is perfect for reading a map finding your stuff in the tent and the 60 lumens will light up the night sky. The 60 lumens of light is great, the beam of light is consistent and does not have any voids. This flashlight is waterproof too. Bottom line: The main reason I chose this flashlight for the list of best AAA flashlight, is the 60 lumens and keychain option. This super small flashlight will hardly be noticed while carrying it. There are so many other great AAA operated flashlights on the market . If you have your BEST Flashlight of choice, please leave a comment or send in your review to add to the list. We would love to hear your input.